Conduct an Interchange Modification Study (IMS) to improve safety and congestion at the KY 14 (Mary Grubbs Highway) intersections with southbound the I-75 ramps and KY 1292 (Beaver Road). Rebuilding the I-75 interchange with KY 14 (Mary Grubbs Highway) will provide an opportunity to improve safety, congestion and mobility along KY 14. 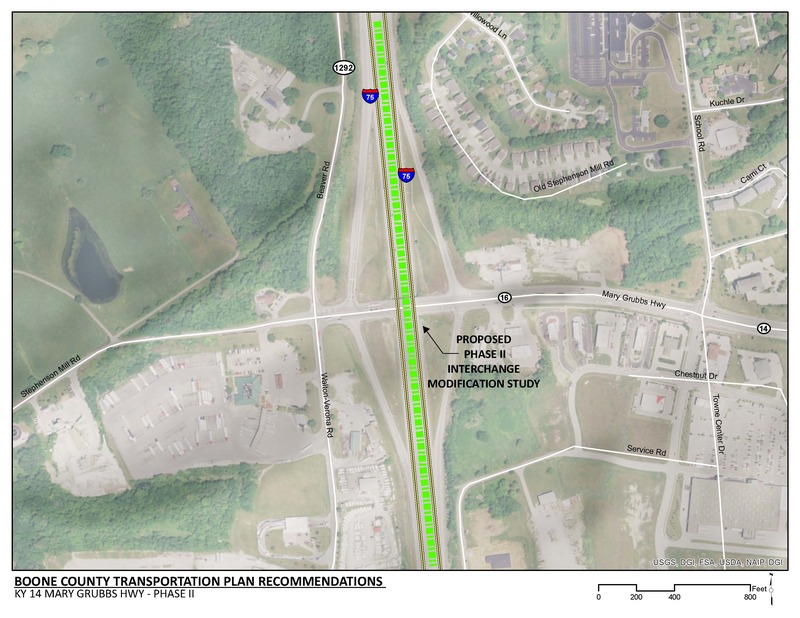 The project will address safety and capacity issues relating to the intersection spacing between the entrance to the Flying J truck stop, the KY 14 (Walton-Verona Road/Mary Grubbs Highway)/KY 1292 (Beaver Road)/Stephenson Mill Road intersection, and the I-75 ramp terminal at KY 14. The project will investigate potential capacity improvements east of the interchange, along KY 14 to US 25 (Dixie Highway). The project will require coordination with impacted property owners. The existing ramp from southbound I-75 to KY 14 (Mary Grubbs Highway) is one that widens into two lanes at the ramp terminus. There is one dedicated right turn lane and one dedicated left turn lane. There is a large volume of trucks that exit I-75 at KY 14 and travel to the existing Flying J truck stop located in the south-west quadrant of the KY 14 (Mary Grubs Highway/Walton Verona Road) intersection with KY 1829 (Beaver Road). There is also a large volume of traffic that exits southbound I-75 at KY 14 to travel to the commercial development and growing residential areas east of I-75. The queue of southbound traffic that is turning right at the intersection often extends past the storage that is available for left turning vehicles. This lack of storage results in blocking vehicles from turning right at the intersection. There is approximately 100 feet of spacing between the two signalized KY 14 intersections with KY 1292/Stephenson Mill Road and the southbound I-75 ramp terminal. Due to the short amount of spacing between the traffic signals, there is insufficient storage on KY 14 to accommodate queues of traffic and the signals are difficult to synchronize effectively. The I-75 interchange at KY 14 serves a mix of commercial, agricultural and residential land uses. KY 14 at the interchange connects to US 25 (Dixie Highway) in the City of Walton to the east and to the City of Verona to the west. The frequency of crashes along KY 14 (Mary Grubs Highway/Walton Verona Road) in the project area is over five times the statewide average for similar roadways. Additionally, there was one pedestrian crash on KY 14 (Walton Verona Road) at the southern entrance to the Flying J. The primary crash types along this section of roadway are rear end and sideswipe crashes which indicate congestion and sudden lane changes. The closely spaced signalized intersections along KY 14 are likely contributing to the increased crash rate.